Ah summertime. It is hot but that does not stop us from spending as much time as possible outside of the house. We go to the park. We swim. We visit with friends and family. We are always on the go. There is never a shortage of things to do around here in the summer. I find it a challenge to get the kids home, fed, bathed, and in bed on time. Then we get ready and do it all over again the next day. But what do you do when it rains? Sure a little downtime every now and then is easy to handle. We catch up on cleaning and laundry while the kids catch up on their naps. Then last week I thought for a minute we had moved to Seattle. It rained every single day for about 8 days. Sure we needed the rain and I loved the cooler weather but the kids were going a bit stir crazy. Thankfully Phase 4 Films has a solution to those rainy summer days. 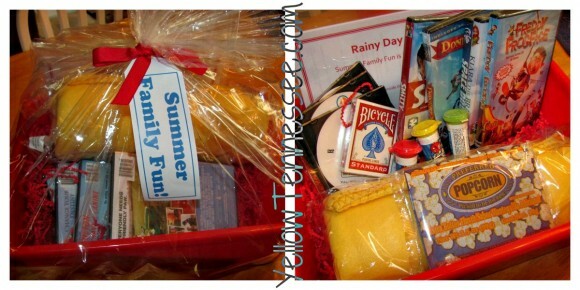 They sent me the greatest basket of Summer Family Fun that was perfect for our week long stint confined indoors. In this basket we received a cozy blanket to snuggle up under, a bag of microwave popcorn, some M&M snacks, a deck of cards, and a selection of movies. Each of these movies is available for rent at your local Redbox to help you turn your rainy days into Summer Family Fun days. This movie was Genghis’ favorite one out of all of them. He has watched it about 3 times already and still laughs along the whole time. What are some of your favorite rainy day summer savers?